The common specification of the ceramics printing al-frame is 320*320mm, 350*550, 600*600, 800*800, 500*900, etc. Every care is taken with these frames. Each frame is finished with tightened inspection and can be used directly. 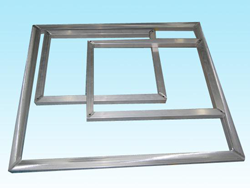 The common specification of the CD printing aluminum-frame is 320*320mm. Every care is taken with these frames. For customer size is available to special design ,please contact us !